As painful as it has been for bearish investors to watch the run-up in U.S. stocks, it’s been even more painful seeing the big gains in Europe’s equity market. 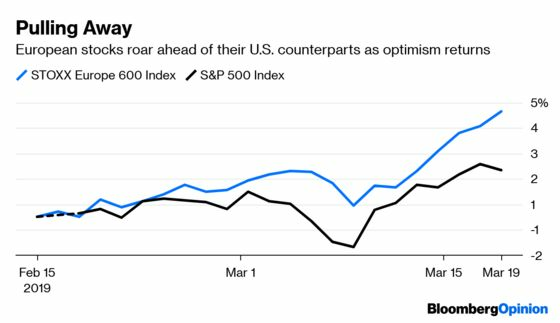 The STOXX Europe 600 Index has been on a tear, jumping 4.16 percent since mid-February to trounce the S&P 500’s 2.41 percent gain. The European benchmark is now at its highest level since September. Although some of this performance reflects the notion that perhaps Europe’s economy may finally be starting to turn the corner along with a more dovish European Central Bank, it could also be a sign that it’s just getting too expensive for the bears to continue carrying positions betting on a drop in European equities. The Bank of America survey found that being short European equities is seen as the most crowded global cross-asset trade. Citigroup Inc.’s economic surprise indexes show that the degree to which euro-zone data is missing estimates is the smallest degree since November. It’s not just U.S. bond traders who are losing confidence in the economic outlook. 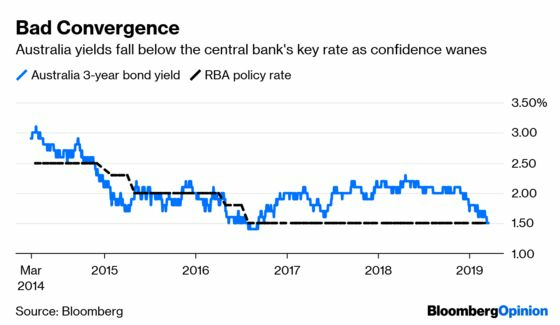 In Australia, three-year government bonds yields dropped below the central bank’s policy rate for the first time since September 2016, underscoring how growth jitters are fueling bets for interest-rate cuts globally, according to Bloomberg News’s Masaki Kondo and Ruth Carson. Yields on three-year debt — more sensitive than longer maturities to rate moves — dropped as much as 5 basis points Tuesday to 1.495 percent. The Reserve Bank of Australia, which highlighted concerns over consumption growth in its March meeting minutes published Tuesday, has kept its cash rate target at a record-low 1.50 percent since August 2016. Although Australia has its own economic problems, this move in the bond market should be concerning for market participants around the world because Australia is viewed as a proxy for China given the close trade ties between the countries. Pork, also known as “the other white meat,” is about to become more expensive. 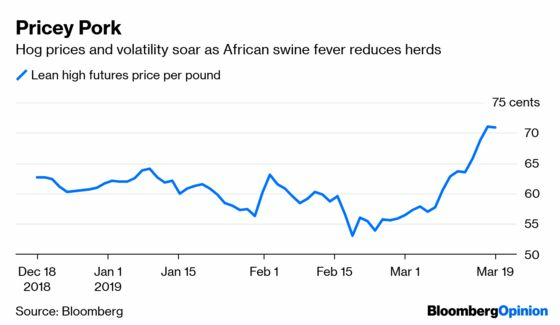 As African swine fever ravages China’s hog herd, the world’s biggest, the supply scare has sparked an increase in panic buying for Chicago futures, according to Bloomberg News’s Lydia Mulvany. 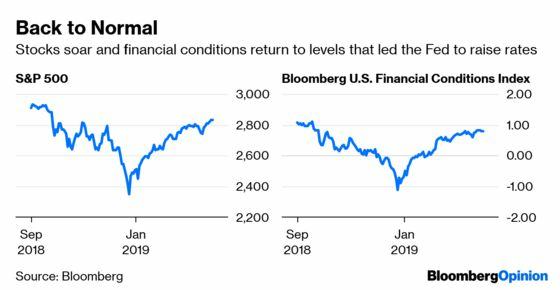 The June lean hog contract is up about 14 percent this month, on pace for a record gain, while a measure of historical volatility has been hovering around the highest since at least 1986. The potential impact on supply means “we can make a bullish case or a crazy wild bullish case,” Rich Nelson, chief strategist at Allendale Inc., told Bloomberg News. China has stepped up its purchases of U.S. pork , buying 23,800 metric tons in the week ending March 7, the most since late April 2017 and the third biggest in data going back to 2013, the Department of Agriculture reported Thursday. At least farmers are happy. New Brazil President Jair Bolsonaro is called the Trump of the Tropics. So there were sure to be some fireworks when Bolsonaro visited the White House on Tuesday. And there was. Trump said he’s “very inclined” to make Brazil an official U.S. ally during an Oval Office meeting with Bolsonaro. The agreement to grant Brazil status as a major non-NATO ally would provide the country preferential access to U.S. military equipment and technology, according to Bloomberg News’s Justin Sink and Simone Iglesias. Brazil would become just the second Latin American country — after Argentina — and 18th nation overall to receive the designation. Traders weren’t impressed. 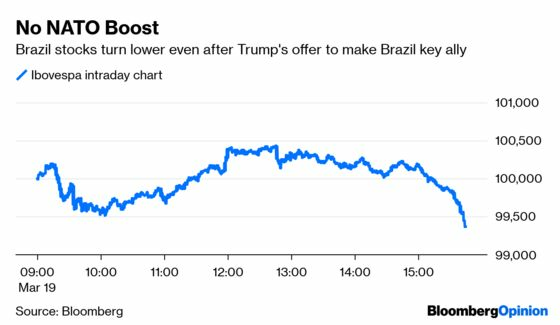 Perhaps they viewed the gesture as an empty promise, as the Brazilian real barely budged and the Ibovespa index of equities fell. Whatever the Fed announces Wednesday, be prepared for an outsized market move. The S&P 500 Index dropped 1.54 percent after the Fed’s Dec. 19 monetary policy meeting and soared 1.55 percent after the Jan. 30 decision. The strategists at LPL Research note that stocks haven’t moved either up or down by more than 1.5 percent on successive Fed decisions since 2011. Get used to it. With the federal funds rate at the lower end of the range that is considered “neutral,” the outlook for monetary policy less predictable. That situation fosters a lot of volatility. One reason volatility was so low in recent years, even as the Fed hiked rates nine times and began shrinking its balance sheet, is because the Fed’s “dot plot” of rates and economic projections meant that everyone knew what the Fed was going to do, when it was going to do it and by how much it was going to do it. There was no mystery. The other thing to consider is that the Fed chairman held a press conference after only a few meetings each year. Now there’s one after every meeting, raising the odds that some off-the-cuff remark could send markets gyrating.